A few months ago I read Robert Hilburn's excellent new biography Johnny Cash: The Life. Highly recommended. Hilburn's biography got me so into Johnny Cash that I've been listening to him almost constantly. So I thought I'd devote posts this week and next to the theology of Johnny Cash. Cash got his big break in 1954 when he walked into Sam Phillips's Sun Records in Memphis, TN. Phillips was just starting out and his big client at the time was the young Elvis Presley. Cash would eventually be the second great star of Sun Records, followed by the signings of Jerry Lee Lewis and Roy Orbison, helping Sam Phillips carve out and shape the sound of early Rock 'N Roll. "I Walk the Line" was one of Johnny Cash's earliest Sun Records hits. The song was recorded in 1956. Cash grew up loving gospel music but Sam Phillips insisted there was no market for it. Phillips pushed Cash for pop songs along the lines of what Elvis was putting out. In fact, when he heard the song Phillips didn't like the the tempo of Cash's preferred version of "I Walk the Line." Cash wanted the song to be a ballad. But Phillips asked Cash, at the end of the recording session, to do one uptempo version of the song. Just for fun. Cash reluctantly agreed. 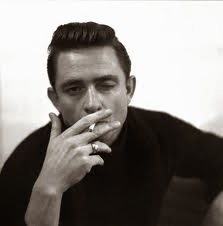 Soon after Cash was shocked when he heard "I Walk the Line" on the radio. Phillips had sneakily released the uptempo version. But Cash couldn't object too much. The song became a hit. The song was inspired by Vivian Cash's worries about her husband being faithful to her on the road. Cash wrote the song to reassure her of his love. "I Walk the Line" is a song of love and fidelity. Interestingly, Cash got the last laugh over Sam Phillips. While Phillips didn't publish Cash's preferred version of "I Walk the Line" Johnny Cash figured out a way to smuggle a gospel song past the record producer. While ["I Walk the Line"] is undeniably inspired by his love for Vivian, Cash sometimes spoke of a second meaning. Though he never confronted Phillips about it, Cash missed his gospel side, and he designed "I Walk the Line" as an expression of spiritual as well as romantic allegiance...During an interview just months before his death, he smiled and told me, "Sam never knew it, but 'I Walk the Line' was my first gospel hit." I thought we'd start this series with Cash's first big hit along with its twin meanings and how those meanings played out in Cash's life. "I Walk the Line" is a song of both marital and spiritual fidelity. And in both cases Cash struggled mightily. Again, "I Walk the Line" was written for Vivian Cash, Johnny's first wife. Vivian and Johnny eventually divorced and Cash later married June Carter. And their relationship, while difficult at times, did end up being a wonderful marriage and partnership. Still, it's hard to look back on "I Walk the Line" and not think of the broken promises to Vivian in light of the lyrics of the song. Which brings us to the spiritual side of the song. If "I Walk the Line" was a covert expression of spiritual fidelity to God Cash struggled here as well. Cash's decades long struggles with addiction are well-documented and in his biography Hilburn pulls no punches describing the darkness of Cash's addiction and the toll it took on his family and friends. Consequently, in my estimation "I Walk the Line," with its dual pledge of loyalty and the way Cash struggled to live up to those pledges, is the perfect crucible for coming to grips with the theology of Johnny Cash. Here was a person and an artist who tried to stay faithful but failed over and over. And yet, Cash never gave up trying to "walk the line." He reconciled with his children from his first marriage. And he kept coming back to God, over and over, even in the darkest days of his addiction. Cash wasn't able to walk the line. But he never gave up trying, never gave up struggling to live up to those promises. And in this Cash's life and the song "I Walk the Line" express the spiritual journey that many of us have walked. Falling, stumbling. But getting back up. Confessing. Repenting. Fighting on. Trying, over and over again, to walk the line. Loved this post, Richard! I grew up on Cash's music, and have always listed his autobiography as one of my favorite books. His life reminds me a lot of Brennan Manning's life. Both men were made deeply aware of their dependence (and the immense scope) of God's grace because of their continued struggles with sin. Perhaps I love the example of both of these men because of my own daily need for God's immense grace as well. I've seen that video a hundred times and it still gives me chills. Thanks for sharing. Eager to read about "When the Man comes Around." Became a Cash fan very late when a member of my church handed me the last album he made. It was dark and intriguing and hopeful at the same time. Ultimately, then, it's "Because I'm yours [but for the rhyme], I walk the line". I love this thanks. I had a friend tell me that Desparado by the eagles was such a song. He called it the rocks crying out but I think Henley was dealing with spiritual issues as well. We do write from the heart. Cash's life was similar to the seven spiritual cycles found in Judges: (1) sin - rebellion, (2) servitude - retribution, (3) supplication - repentance, (4) salvation - restoration, and (5) silence - rest. But, come to think of it, that's pretty much the story of most of us, isn't it? The key is not to stay in the valley, pick ourselves up and try again. That is the nature of our being, which is why we need mercy and grace. Same with me. Powerful song. I was totally into your 7 spiritual cycles . . . but, you only listed 5. What are the other 2? I didn't make that very clear; sorry about that. There were seven different cycles with each cycle containing the five steps or parts listed. Hope that is clearer. God's patience and willingness to deliver was amazing though they were making the same journey so many times. Thanks for calling that to my attention.